If you a trekking enthusiast, you must be well-aware of Kalindikhals Trek, famed as an extremely challenging trek through the Kalindikhal Pass in the Garhwal region of the Himalayas. 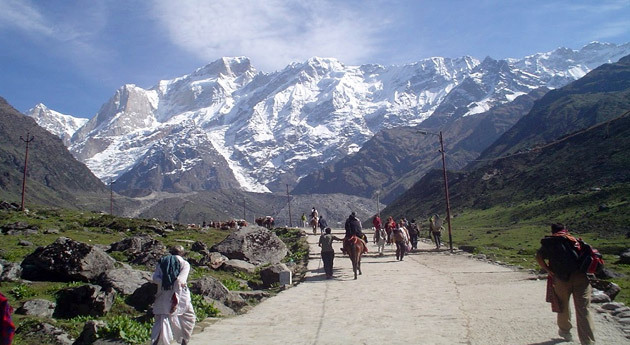 India Pilgrim Tours offers Kalindikhals Pass Trek, a tour package of 17 days and 16 nights that includes trekking on varied landscapes such as snowfields, rocky screens and rough glaciers. The itinerary also includes temple visits in Rishikesh, Badrinath, Gangotri and Haridwar. During the trek, you cross popular trek route destinations like Vasuki Tal, Gomukh, Mana village and Arwa Tal. Once you reach at the Delhi Airport / Railway station, meet IPT tour representative who helps you with an on-road assisted transfer to Rishikesh. After you reach Rishikesh, also known as the Yoga Capital of India, complete the check-in formalities at your pre-booked hotel. The evening is free you to do your own activities. You can visit the Ashrams, the temples and the other attractions of this sacred place. If you want, then you can also attend the Aarti on the banks of Holy River Ganga. After relishing dinner at the hotel, have a good night’s sleep. On the 2nd day of the tour, post enjoying the breakfast, leave by road for Uttarkashi, located at an altitude of 3799 feet above the sea level. After arriving in Uttarkashi, which is also famous as the Kashi of North, check-in at your hotel. The rest of the day is free for you to indulge in leisure activities. You can taste the local food, can interact with the locals, can explore the local attractions of the town, can discover the beauty of the lush surroundings on foot, etc. Uttarkashi is also famed for being the base for some of the best trekking and mountaineering excursions in the Gangotri region. Stay overnight at Uttarkashi. On day 3, once you have your breakfast, hit the road towards Gangotri, through Harsil. 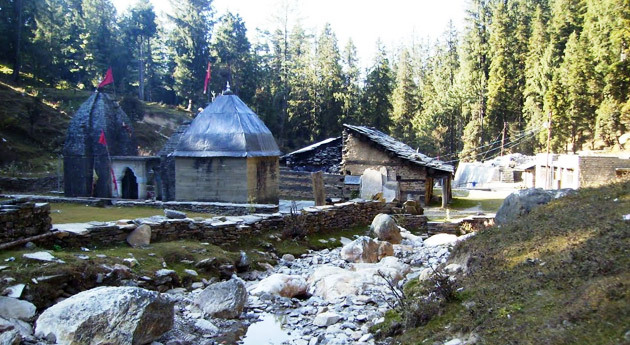 The beautiful Hindu pilgrim town, Gangotri is placed on the banks of the River Bhagirathi. Located at an above the sea level of 3100 meters, this serene town is also famed as the originating point of the River Ganga. Once you complete the check-in formalities at your pre-booked hotel, visit the most popular Ganga temple, dedicated to River Ganga, as Gangotri is the seat of this Holy River. Apart from this, you can also visit other tourist attractions like Kedar Tal, Dodi tal, Kedar Tal, Vishwanath temple etc. Overnight stay. After breakfast, start trekking towards Bhojwasa (3792 meters) via Chirbasa (3600 meters). The beaten route from Gangorti to Chirbasa that is on-tree line runs along the free-flowing River Bhagirathi. After you cross Chirbasa, which is also called the Arctic Tundra trek, the route becomes isolated and barren. While you continue your trek for Bhojwasa, you cross lush forest. After reaching Bhojwasa, when you trek down to the river, you see a small temple. Set-up your camp on the banks of the river, near the temple. Relax for a while. Now you are free to indulge in the activities of your interest. Admire the beautiful scenery spread all around. Enjoy the mesmerizing Sunset view while it is setting on the Bhagirati peaks. After dinner, have an overnight stay in the tent. On the 5th day, after you have your breakfast, begin trek towards Nandanvan (4500 meters) through Gomukh, the originating point of river Ganga. 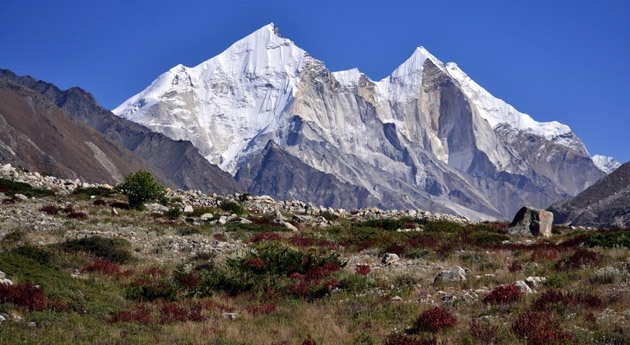 After you reach Gomukhm may be because it is in the shape of a cow’s mouth, begin climbing to the Gangotri Glacier. This glacier is the source of Ganga water and if you wish, you can dip in the chilled waters. After marveling at the scenery spread around and enjoy the serene atmosphere, start trekking along the right bank. Thereafter, you start your trek to Nandanvan that is just ahead of Tapovan. This glacier track is slippery and so you need to be careful. Nandavan is popular amidst trekking enthusiasts as the base camp for climbing the Bhagirathi group of mountains. Night stay in tents in Nandavan. After a hearty breakfast on day 6, begin walking along the Chaturangi Glacier. This route, along the stream, offers you some nice views of the Meru and Bhrigupanth peaks. After around 4 hours, you cross a valley that leads you to the Bhagirathi Valley. You finally arrive at a gorge that was formed by the retreating glacier. After slightly going across the glacier you arrive at the base of the lake, called Vasuki Tal, probably named after the legendary Vasuki Serpent. Set-up your camp under the northern tip of Vasuki Parbat. Lake Vasuki is a half-frozen lake, which is at the base of Vasuki Parbat and Mt Satopanth. Absorb the serenity and natural beauty spread all around. Overnight in tents. After you have your breakfast on the 7th day, start trekking to Suraiaya Bamak (Khara Pathar- 5480 meters). Carry packed lunch. 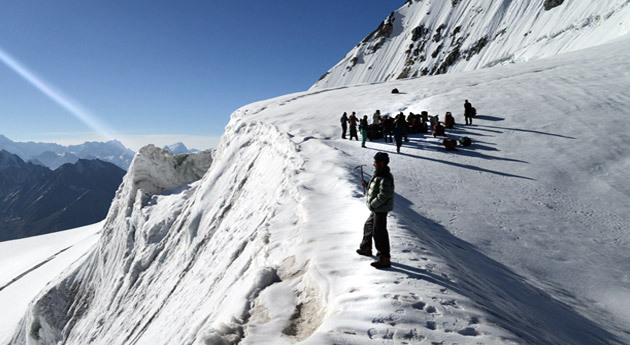 For around 5 km, you climb a steep trek crossing glacial debris. Thereafter, after crossing the glacier diagonally, you pass all the glacial debris. It is advisable that has the trek of day is around 5-6 hours, you must start your trek early. Set your camp on the moraine and enjoy the excellent views of the Bhagirathi, Gangotri and Shivlinga group of mountains as well as the Kalindi pass. From such a high altitude, you can also have a nice view of Tapovan. Have your dinner and then an overnight stay in the tent. On the 8th day of the tour, you are free to for acclimatization. Just take a rest in your tent for sometime after breakfast and later, you can spend the rest of the day in exploring the surroundings on your own. The white sheet of snow looks simply amazing. Treat your eyes to the picturesque beauty spread all around you. Discover the hidden beauty of the region. Do not miss clicking some amazing photographs. Dinner and night stay in the camp. Post breakfast on day 9, you begin your 10 km trek to arrive at the Kalindikhal Base, which is at the Sita Glacier (5500 meters above the sea level). The trek route of today follows the Chaturangi Glacier. Once you arrive at your camp, set-up your camp. You are now free to get acclimatized to the climate and oxygen levels at such a high altitude. Treat your eyes to the scenery spread all around you. Stay overnight in the tents after dinner. Relish your morning breakfast. The trek of day 10 is going to be the most challenging one that includes a steep climb up to the Kalindi Pass, which is at an altitude of 5967 meters above the sea level. Once you reach the top, admire the beautiful scenery spread all around you. After spending some time here, begin your downward trek to Rajparav, 4910 meters above the sea level. The descending trek from the pass is a steep one, over the ice walls and the glacier. Once you reach Rajparva, set-up camp your for overnight stay. It is likely that you reach the camp site by evening when it is time to rest and enjoy the tranquility spread all around. After breakfast in the morning, you start your 13 km trek that will lead you to Arwa tal, which is 3910 meters above the sea level. Arwa Tal is a beautiful serene lake on such a high altitude. The trek route of today follows the Arwa Bank Glacier. Finally, you reach Rajparav. Set-up your tent at the campsite. The pristine beauty spread all around you offers you a chance to experience inner peace. After dinner, stay overnight in the tent. On day 12 of the tour, you start your 16 km from the camp site to arrive at Ghastoli (3796 meters). The trek that you undertake today is gradually is a descending one, while you are following Arwa Nala all along. On arriving at the camp site, set-up your camp. While trekking, it is important that you are careful of the slippery path. Treat your eyes to the nature’s beauty of snow-clad peaks. After dinner, overnight stay in camp. After you relish your breakfast, begin trekking from Ghastoli to reach Mana village, which is located at a distance of 16 km away. Placed at an altitude of 3200 meters above the sea level, Mana is the last village of this valley before the Mana Pass, before the border of India and Tibet. After reaching the Mana village, get assisted on-road transfer to Badrinath that is just 3 km away from here. One of the four destinations of Charmdham Yatra, Badrinath has the temple, dedicated to Lord Vishnu. After you reach Badrinath, complete the check-in formalities at your pre-booked hotel. The rest of the day is free to indulge in leisure activities or simply relax in the comforts of your room. Stay overnight. Day 14 after breakfast is for exploring the holy town of Badrinath. Located in the Chamoli district of Uttarakhand, this town is sandwiched between the Nar and Narayan mountains. In the morning, attend the mesmerizing Puja at the Badrinath temple. Later, the rest of the day is free. You can visit the remaining sacred attractions of Badrinath such as Narad Kund, Brahma Kapal, Shesh Netra, Tapta Kund etc. Overnight stay in the hotel. After you have your breakfast in the morning, hit the road to Joshimath. After reaching, complete the check-in formalities at your pre-booked hotel. The afternoon is scheduled for an excursion to Auli, which is just half an hour’s drive away. Also known as Bugyal, Auli is a very well-known ski destination during the winter season. Indulge in adventure activities here and enjoy an amazing view of the Nanda Devi mountain range. Back to Joshimath for an overnight stay. On day 16, have your breakfast and hit the road to Haridwar. Once you reach Haridwar, check- in your hotel. The rest of the day is free for leisure activities. Attend the evening Aarti on the Ganga Ghats or visit the popular temples such as Bharat Mata Mandir. Stay overnight. Today is the last day of the tour. Have your breakfast. Thereafter, get an assisted on-road transfer to Delhi Airport or Railway station to go on-board a flight or train for your onward journey.